Capitola was originally founded as the resort, “Camp Capitola,” and was incorporated as a city in 1949. Located along Highway 1 between Soquel and Aptos, Capitola is the state’s oldest seaside resort town. A uniquely charming area, Capitola offers a variety of housing styles and neighborhoods within relatively small geographic boundaries. The city’s charming riverside and wharf districts are often likened to a quaint Mediterranean village. The city also features a charming village area nestled on a wide beach between two towering bluffs overlooking the waters of northern Monterey Bay. 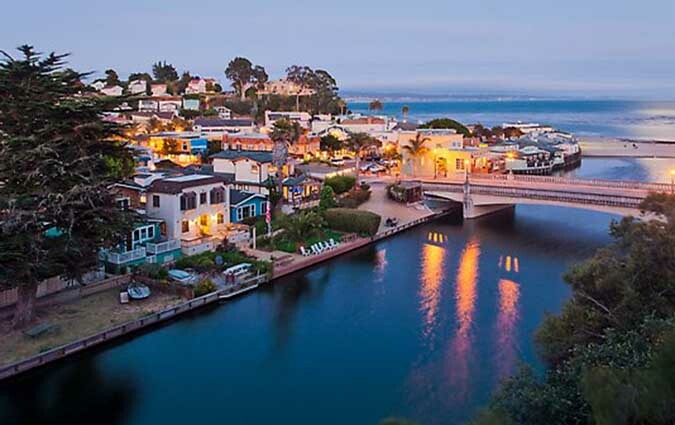 Known as Capitola Village, this area with its breathtaking vistas is home to several art and craft galleries, boutiques, and casual restaurants. In addition, Upper Capitola Village provides a variety of shopping options from the unique to traditional. The area known as Forty-First Avenue, serving as the city’s commercial and economic hub, is also home to the county’s only major enclosed mall. Each September, Capitola hosts the Begonia Festival. Festival activities include filling the Soquel Creek with flower-draped floats created by local competitors. During September, area residents and visitors also celebrate the Capitola Art and Wine Festival. The recreational amenities of New Brighton Beach State Park rounds out the city, offering outdoor activities on a forested bluff that overlooks scenic Monterey Bay.